Looking over the Switch eShop for upcoming releases has become something I do daily because in many cases ports have been listed on the eShop before they get officially announced. 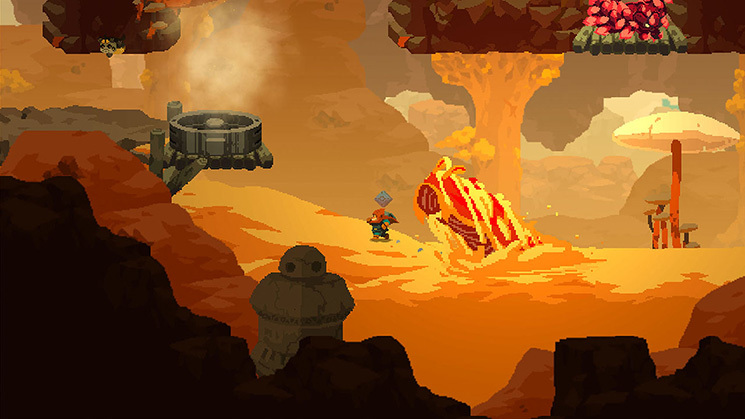 Seeing a game published by Humble Bundle on Switch already had my interest piqued, but after checking out Aegis Defenders, the premise had me more interested than the jaw droppingly gorgeous art. 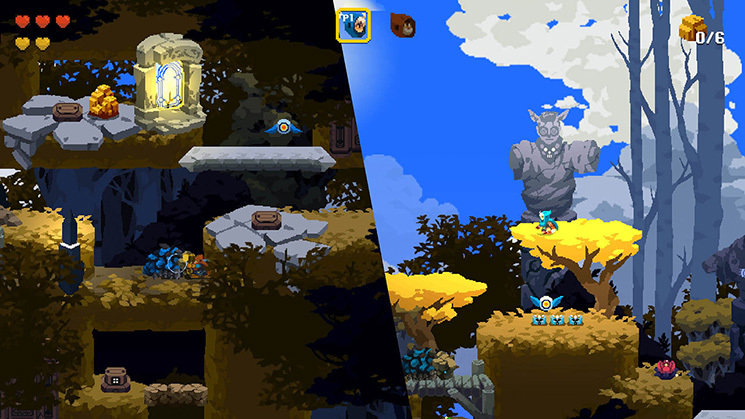 Aegis Defenders is a game about exploring akin to many metroidvanias followed by building and defending in a tower defence sequence. That’s basically the game flow for the most part. On paper, it doesn’t seem like this would work out well, but GUTS Department has clearly pulled it off. You play as a group of RuinHunters trying to save your village. As the name suggests, you need to get the Aegis and before you ask, this isn’t Xenoblade Chronicles 2. I didn’t really think there would be a story or even characters to write home about, but I cannot stop gushing about how lovely the designs are here and how those contributed to me caring a lot about them. At first, the metroidvania like explore sections feel a little floaty. The controls take a bit of time to get used to, but the environment is full of life. I love that you can interact with a lot of things and almost everything serves a purpose outside of the ground of course. Your aim is to take out the enemies and explore. This involves solving some puzzles as well. You can play it completely solo, but it gets a little annoying switching between characters to solve a puzzle. Thankfully, this switch happens instantly, but I’d still recommend playing this with a friend. The tower defence segment involves characters setting up traps, turrets, and more and then going on to defend while taking out the incoming enemy waves. Once this is done, you go on to upgrade. Despite mentioning the visuals a few times already, I’m still blown away by the lovely animations for characters and the gorgeous world. It almost feels like a spiritual successor to Squaresoft’s 16-bit era. Even the load screens and splash images look awesome with their painted style. There’s also a nice use of colours to determine the strategy you need to take against certain enemies. A combo of multiple things together when it comes to how you craft will make things even more complex. Aegis Defenders on the Switch runs at native resolution in handheld mode and I didn’t run into any issues. While the frame rate is lower than the PS4 version, this works out brilliantly in handheld mode with the option to play in split screen with a single Joy-Con each in handheld mode. Aegis Defenders is all about combining things you didn’t think would work well together. This extends to the music and voice acting. I didn’t think a game like this would have voice acting, but there is basic voice acting with some dialogue that’s really nice and fitting for each characters. The music on the other hand is a polar opposite to the pixel art visuals. One would expect chiptune music, but this is the opposite almost with a combination of orchestral and synth sounds. You better believe I immediately bought the soundtrack after an hour of gameplay. While the co-op element works brilliantly, the single player aspect gets a little tiring. The team has done a brilliant job of making it as quick as possible to switch characters, but you can tell this is made for co-op. Aegis Defenders is a must have on the Switch with the caveat of you having a co-op buddy. There are tons of great co-op experiences on Nintendo’s hybrid but this is easily one of my favourite. I’m glad Humble Bundle and GUTS Department decided to put this out on the Switch because it is yet another game that’s perfect on Switch. 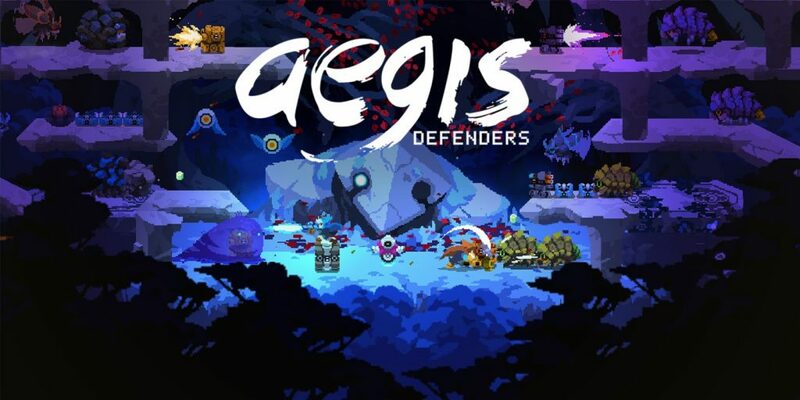 Aegis Defenders takes two genres I like on their own and blends them together to create a memorable and fun experience that absolutely shines in co-op.